August purchase was actually a gift from the husband. We just celebrated our milestones anniversary last month. The plan was to take a trip somewhere but his travel schedule was just too crazy for the month of September. 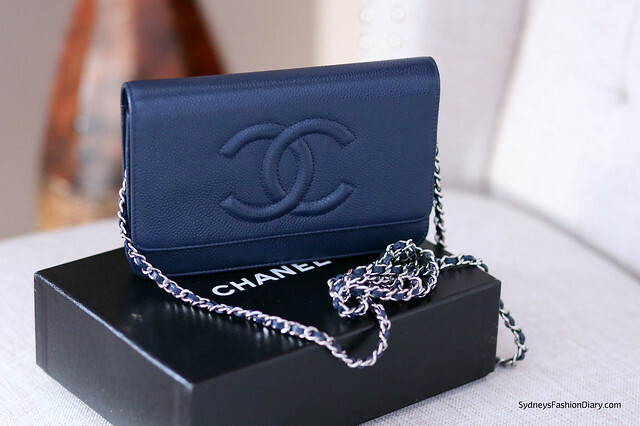 Since we decided to forgo the trip, he said I can cross something off my wishlist as a gift for our anniversary =) I ended up getting the Chanel wallet on chain in navy. I was looking for a non-black, caviar, silver-hardware WOC and this little beauty couldn't be more perfect. I can't even express how much I adore this bag. It's classic, timeless and functional at the same time. I am not going to review this bag. These days, you probably can find anything you want to know with a few Google searches. Pre-own Chanel WOCs are widely available on the market these days. Just a quick search I found many pre-owned versions available here or get the exact same one here. Stunning gift! He knows what he is doing! Happy anniversary! Hope you can take this bag on a trip you'll take later :).